OK, the subject matter of today's blog may seem a little off-topic for me, but hang in there, because I have something I want to say. Last night, I overhead a conversation between my husband and our good friend, Chris, who lives in Montana. For years, these two renaissance men have shared many conversations about their love of traditional bow-hunting and their respect for the animals they have hunted. Neither are "trophy hunters", and enjoy the rich heritage that hunting with a bow affords them. But their latest discussion centered around their distaste for what the "sport" of hunting has become. In years past, Chris and his wife, Darcy, have enjoyed hunting deer and elk during the Montana winters, and are bringing up my Godson, Hunter, in the traditional ways to harvest meat. But just as our culture has abandoned established and time-honored traditions, we are seeing the same thing in hunting, too. It seems that the bane of traditional hunters has been the move by social media and "star quality" hunting shows to brand themselves as superstar hunting experts. The drive to sell products, develop a product line, and create a following is ruining the art of hunting. Just like social media and the internet has contributed to the downfall of our culture and our kids, it has also taken its toll on the intimacy and spiritual side of hunting. What was once a sacred and solo endeavor in the woods, has now become a product-driven, success-driven, and trophy-driven business. Both my husband and Chris lament how difficult it is to hunt these days; especially for Chris who has much more access to big game in Montana, than we do here in Texas. Not only do we have the ridiculous chatter of PETA degrading the practice of hunting, but this has led to an onslaught of "photo" hunters tromping through the woods and spoiling the natural environment that is necessary for a successful hunt. 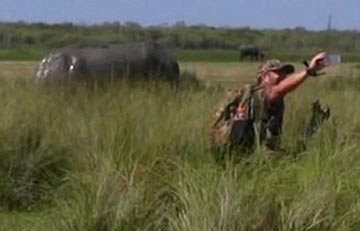 Add to that film crews for the latest "hunting show", and the original purpose for hunting is out the window. 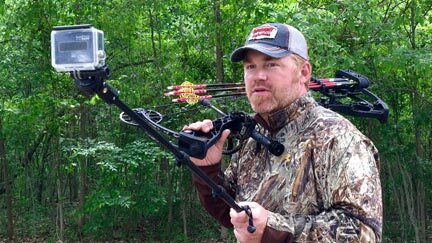 GoPros and selfies don't belong in the woods! The use of them to announce to the Facebook crowd that you're a "big-time hunter" is not only undignified, but demeans the legitimate killing of an animal. I say "legitimate" because God actually condones hunting animals in the Bible. First of all, in Genesis, the very first book of the Bible, God gives man dominion over animals, birds, and fish. All live in harmony on the earth, until Adam and Eve are disobedient and cast out of the Garden. But guess what God did? Applying His grace to their naked state, He sacrificed an animal for its hide and clothed them. Until you get to Chapter 9 in Genesis, both man and animals were vegetarians, with God providing plants to feed them both. Then after the Flood, God gives Noah and his family permission to eat of the animals that survived on the ark. And who doesn't recall the Patriarch Isaac requesting that his son Esau "go out to the field and hunt game for me, and prepare for me delicious food, such as I love, and bring it to me so that I may eat". So, it is very clear to me that hunting is a righteous and honorable tradition among men. But, I am also aware that man can corrupt anything he lays his hands on. I have read far too many articles, and heard too many stories, of unprincipled and immoral men "hunting" animals in despicable ways. There is the story of a Guide and Outfitter in Maine who ran across a group of men "bragging about how they had chased a moose with their truck. There to hunt deer or bear, they had just happened onto the bull. They laughed, describing how close they had gotten to the animal and how wildly he had run." There are always the stories of men who just want the glory of a mount to hang on their wall, and disrespect the animals that gave their lives to provide bragging rights for that hunter. God even has something to say about those hunters who waste the meat: The lazy man does not roast what he took in hunting, but diligence [effort, persistence, dedication] is man’s precious possession. And, of course, I don't need to tell you that far too many of these kinds of "hunters" are reckless with their weapons, and gun safety is low on their priority list. These men do a disservice to all the hunters who, like Chris and my husband, respect and honor not only their heritage of hunting, but the animals, themselves. I don't know what it is about our culture, but it seems that everything that was once good for the harmony of the land, which includes man's role and responsibilities regarding his place in creation, has become corrupted. It's as if his legal authority is being diminished and traditional values are perishing. The dominion we were given by God over the earth is being usurped by Satan and technology, and is ruining God's intentions for man as hunter. We also see it in the family unit; in the sanctity of life; in our disrespect towards our fellow man; and now in the ways that even hunting is changing. For those lucky enough to experience it, hunting has been a time-honored custom in which fathers can spend time with their sons (and daughters), and teach them to honor and respect all animals, which are under our dominion. True, it is not necessary to hunt for food at this moment in time... meat is still readily available in your local grocery store. But there is nothing like taking the responsibility for harvesting your own food to teach you not to take it for granted. It is a sad thing for me to hear both my husband and our friend say that it is getting more difficult for them to enjoy hunting. And it is a sad day when the callousness and selfishness of our culture invades the art of hunting.... one more good and decent tradition goes by the wayside. Genesis 21:20 "And God was with the boy, and he grew up. He lived in the wilderness and became an expert with the bow."